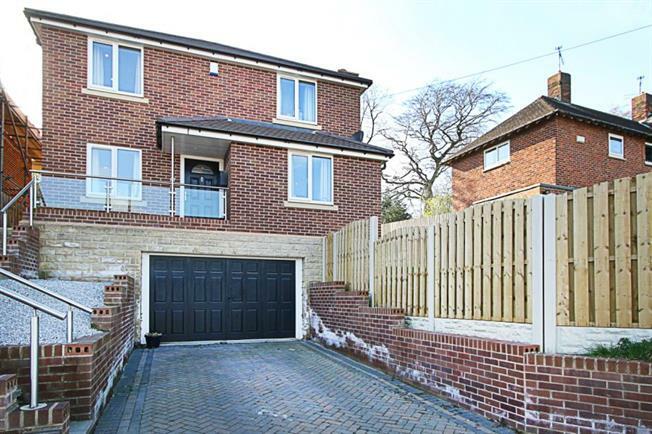 3 Bedroom Detached House For Sale in Sheffield for Guide Price £230,000. Blundells are proud to bring to the market this absolutely STUNNING, Three bedroom detached property. Situated in the heart of Handsworth, the property is beautifully presented throughout with a larger than average integral garage, an early viewing is ESSENTIAL to appreciate this immense family home! In brief the property comprises of; To the ground floor the entrance hallway provides access into an immaculate living area with electric feature log burner. There is a gorgeous, open plan, modern fitted dining kitchen with breakfast bar, integrated appliances and French doors providing access to the rear of the property. A door from the kitchen leads into a fantastic utility room and further downstairs cloakroom. The property also boasts a further third reception room which can be used as a study/playroom or snug. To the first floor is the master bedroom with tremendous floor space and en-suite, a further second double bedroom, third double bedroom and modern family bathroom suite. The property benefits from a block paved driveway for several vehicles to the front and an integral garage covering the whole of the downstairs floor space. There is a landscaped, enclosed wrap around garden to three sides. Ideally suited to a couple or family, this sure is the ultimate family home! A property not to be missed!